I've had bunny making on my mind for weeks. There are so many great tutorials out there, but I couldn't find just the right one. I wanted something tiny... a pocket bunny, a fit-in-a-small-hand bunny. Inspiration struck when my daughter and I were cleaning up her doll clothes. Her tiny wooden clothespins were scattered everywhere. Turned upside down the tips looked surprisingly like bunny ears. I've seen many animals made out of wooden clothespins, but they were all hard. Usually Christmas ornaments (think Rudolph). I wanted something soft and sweet. Maybe I could make one similar to the fairies we like to create, but replace a wooden bead with a clothespin for the head. 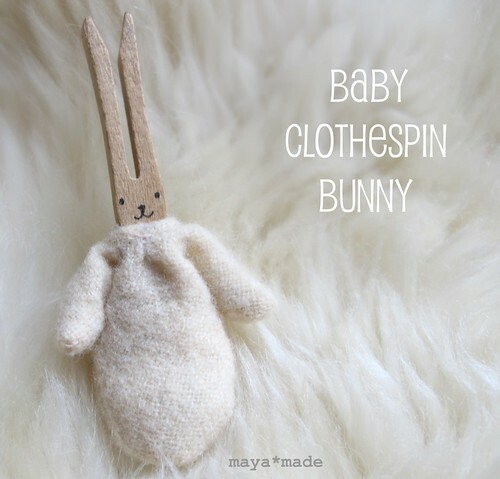 Faster and easier than a fairy baby... a miniature clothespin bunny was born! 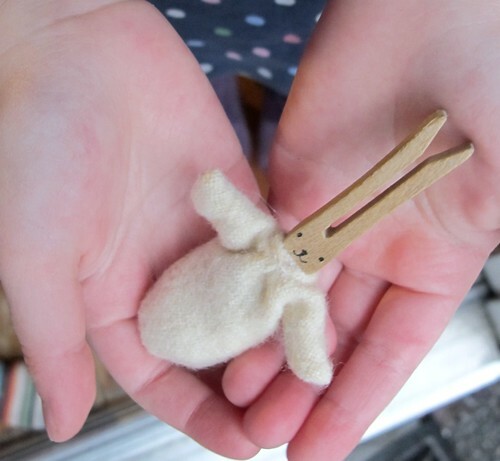 I know not everyone has doll clothespins, but these types of wooden pegs are available at all craft stores in a regular size, and I think they'd be just as sweet. The instructions are the same for whatever size peg/pin* you have. 1. 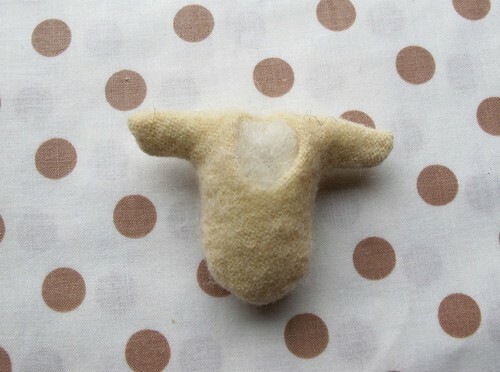 Fold piece of felt in half and cut out body shape similar to the one pictured here. The fold line is along the shoulders. 2. 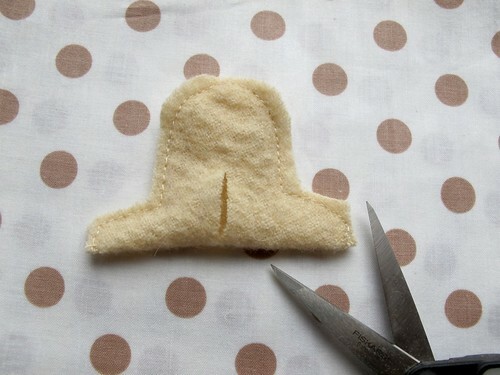 Sew around the entire open perimeter by hand or machine. Do not sew over fold line. Cut a straight slit approximately 1" long down the center of the back. 3. Turn right side out through the slit. Poke out sleeves with a chopstick, pencil, etc. 4. Fold a section of pipe cleaner to form a T as shown. Make sure it fits the dimensions of the body. 5. Wind some roving around the wire and then insert it into the slit in the felt body. Keep adding little bits of roving until the sleeves are padded and the bunny's shape has rounded out. 6. Insert the clothespin deep into the slit and then begin stitching closed the opening. 7. Before the thread is snipped, poke the needle towards the front. 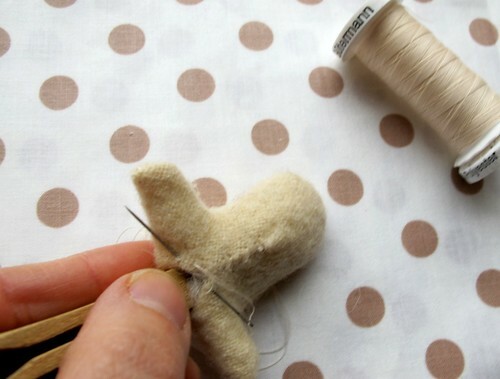 Sew a few stitches around the neckline to ensure that the soft body is securely attached to the wooden head on both sides. 8. If you haven't already, draw a simple face on the front of the clothespin. Done! Even sweeter than I could have hoped for. She fits into a pocket, a small hand, and even an egg cup! Now, just because I'm smitten with something, doesn't mean that it will meet my daughter's approval. Although she's (almost) always polite, I know when she truly loves something or not, and my crafting ego is at her mercy. But it was adored instantly! Yay!Those posable arms, round tummy, and simple little face won my girl over so much that Baby Bunny got the most coveted treatment of all soft animals... "Can she sleep with me tonight, Mama?" That was last night. As I write this post, the two of them are still snuggled in bed together reading every book about bunnies that we have on our shelves. *Because of the size, these are not intended for children under 3.
just soooooooooooo pretty and sweet!!! My daughter would LOVE this! I may have to pick up some tiny clothespins when I'm in town this weekend. . . So cute! I'll keep this one in the back of my mind for when my daughter is a little older! oh my god, that is the most precious thing! 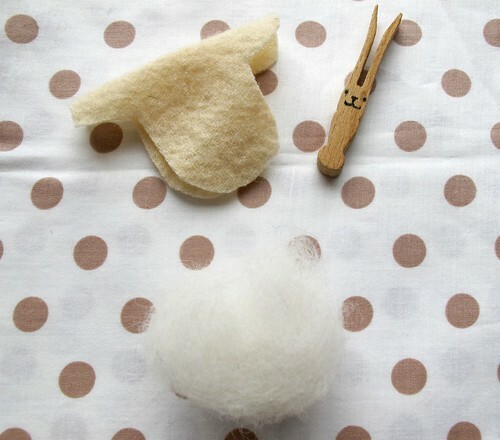 I know I have some nice bamboo fleece that would be perfect...now to find some clothespins! so sweet - I think that the pipe cleaner is absolutely brilliant! awwww ... just as sweet as can be! 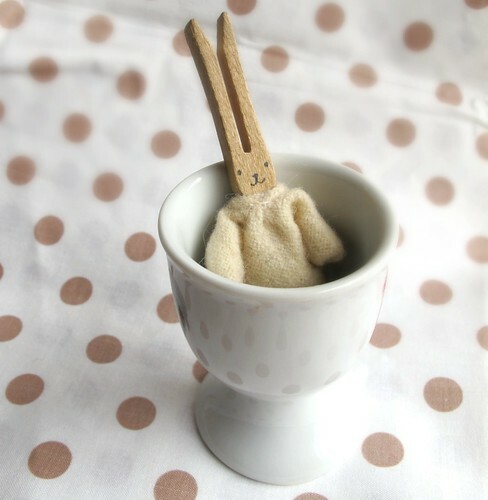 I've been searching all over the net looking for some little handmade goodie to hide on Easter and this is perfect! Thank you!! Very sweet. Perfect little gift for an Easter basket. I will be making a few today. Thank you! I love that bunny! Such a wonderful idea...thanks for sharing the tutorial. This is adorable! I'm headed out to find clothespins!! Thank you Maya! so darling! love this so much, Maya! Absolutley adorable! Thanks for the how-to! CUTE! I have to make these - adorable. This is absolutely adorable! I'm thinking this would be a big hit in my girls' Easter baskets! 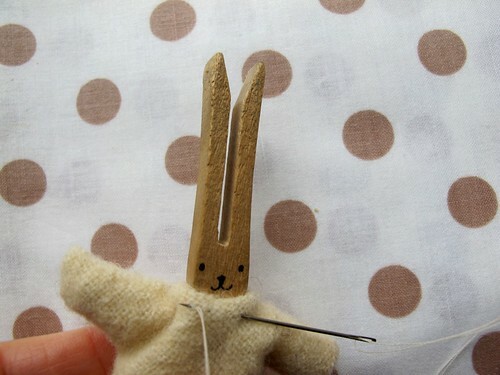 So soft and sweet..I'm just embarking on making little peg people...hopefully some bunnies! These little ones are adorable. Thanks. What a sweet handmade gift for a little child! ooooh dear... these are so freeking cute!!! here I go to the fabric store... hahaha... thanks for the most loveliest pretty things to make! so inspired! Oh my goodness...that is the cutest little baby bunny ever! Thanks so much everyone! And of course I'd love to see your bunnies if you give this a try. So adorable! Love it! Thanks for the inspiration! aw this is so precious! i think i will make min with little legs tho. i dont have any tiny wheelchairs on hand ;) thanks for the fabulous idea! Who wouldn't instantly adore this little soft bunny baby? So very very sweet! this bunny is adorable!! Thanks for reminding us and reposting this today!!! Have a wonderful weekend! I don't even know how to say how cute this is! Thanks for sharing! !